If its any good why am I only hearing about it now? 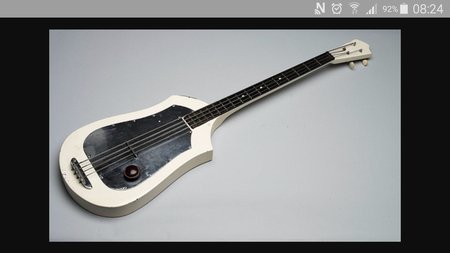 In the 1930s, musician and inventor Paul Tutmarc from Seattle, Washington, who was manufacturing lap steel guitars, developed the first electric string bass in its modern form, a fretted instrument designed to be played horizontally. The 1935 sales catalog for Tutmarc's electronic musical instrument company, Audiovox, featured his ”Model 736 Bass Fiddle", a four-stringed, solid-bodied, fretted electric bass instrument with a 30 1⁄2-inch (775 mm) scale length. The adoption of a “guitar” form made the instrument easier to hold and transport than any of the existing stringed bass instruments. The addition of frets enabled bassists to play in tune more easily than on acoustic or electric upright basses. Around 100 of these instruments were made during this period. Around 1947, Tutmarc's son, Bud, began marketing a similar bass under the Serenader brand name, prominently advertised in the nationally distributed L. D. Heater Music Company wholesale jobber catalogue of '48. However, the Tutmarc family inventions did not achieve market success…."